In a continuing effort to cure cancer, Sagiv-Barfi et al. sought to develop a new, “practical” immunotherapy by using the in situ tumor in three ways: 1) as a source of antigen, 2) as a source of immunoreactive cells, and 3) as an injection site for immune modulators, as described in their study published in Science Translational Medicine. 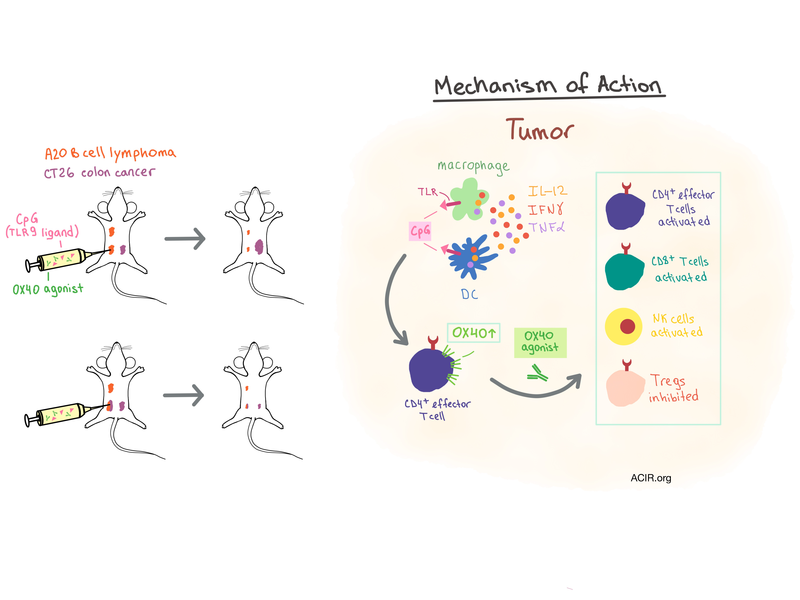 Since Toll-like receptor (TLR) agonists activate numerous cells within the innate and adaptive immune systems, the researchers injected the TLR9 ligand CpG oligodeoxynucleotide (CpG) directly into established subcutaneous A20 B cell lymphoma tumors and analyzed the intratumoral T cells for a change in inhibitory and activation markers. While CTLA-4 and PD-1 expression remained unchanged, OX40 (a costimulatory molecule expressed on effector T cells and Tregs) was upregulated on CD4+ effector T cells, which far outnumbered the Tregs. Similar results were observed in a patient with follicular lymphoma after intratumoral injection of CpG, and in tumor cells from additional lymphoma patients that were incubated with CpG in vitro. Notably, this effect was observed only locally in the injected tumor, and not in a contralateral, untreated tumor site. Based on the results of CpG treatment, the researchers hypothesized that the addition of an OX40 agonist would enhance the effects of CpG and induce an antitumor response. To that end, they injected CpG and/or the OX40 agonist into one of two A20 tumor sites. While CpG by itself led to complete tumor regression at the injected site but not the untreated site, and OX40 agonist alone resulted in only a slight delay in tumor growth at both sites, the injection of both treatments into the same lesion induced complete regression of both injected and untreated tumor sites in all mice. The response was durable and curative, and was dependent on both CD4+ and CD8+ T cells. The team observed similar results in other transplanted mouse tumor models, including CT26 colon cancer, B16-F10 melanoma, and 4T1 breast carcinoma. After demonstrating efficacy in transplanted tumors, the researchers assessed the CpG/OX40 agonist combination treatment in a mouse model of spontaneous breast cancer. MMTV-PyMT transgenic mice received an intratumoral combination injection as soon as their first tumor became established. The injected tumor and any coexisting untreated tumors regressed, and mice were protected from further tumor growth in other mammary glands. Treated mice experienced significantly lower total tumor burden, fewer lung metastases, and increased survival compared to untreated controls, demonstrating that this in situ vaccination can override the effect of a potent oncogene-driven cancer. When mice were implanted with tumors at three different locations – two with the same tumor and one with an unrelated tumor, in situ vaccination into one of the two related tumors led to regression of both treated and untreated related tumors but had no effect on the growth of the unrelated tumor. When a mixture of two different tumors was implanted into one site, while two additional sites contained one tumor type each, injection of the mixed tumor site reduced tumor growth at both distant sites, demonstrating that in situ vaccination can induce a response against different tumor antigens simultaneously. Mice previously cured by in situ vaccination were immune to a rechallenge by the same tumor but not to a different tumor. Overall, these results demonstrated that the immune response was durable and tumor-specific, and that the vaccination works by triggering a local response within the injected tumor microenvironment (TME), leading to systemic immunity, rather than by diffusion of the immune modulators to distant sites. To understand which immune cells and signaling molecules were involved in this effect, Sagiv-Barfi et al. purified tumor-infiltrating T cells and found no OX40 upregulation upon exposure to CpG in vitro. Then, they depleted macrophages and dendritic cells from whole tumor cell populations and found that, once again, the T cells in this environment did not upregulate OX40. As T cells did upregulate OX40 when the whole tumor suspension was exposed to CpG, they concluded that the myeloid-derived cells are responsible for communicating the CpG signal to the T cells, and confirmed that IL-12, IFNγ, and TNFα were involved in the required cellular communication. Digging deeper, the researchers found that the function of the OX40 agonist was dependent on competent interaction with Fc receptors (implying ADCC activity or Fc-dependent agonist activity), which led to an increase in myeloid cell infiltration, activation of NK and CD8+ T cells, and inhibition, but not depletion of Tregs in the TME. Sagiv-Barfi et al. demonstrated that OX40 agonist synergizes with CpG to induce a systemic, tumor-specific immune response without prior knowledge of unique tumor antigens when administered intratumorally as an in situ vaccination. Although the potential clinical use of such a combination may be limited by the necessity for adequate immune infiltrates in the tumor, as well as availability of an injectable tumor site, the results of this study provide strong rationale for clinical testing of the CpG/OX40 agonist combination. Sagiv-Barfi I., Czerwinski D.K., Levy S., Alam I.S., Mayer A.T., Gambhir S.S., Levy R. Eradication of spontaneous malignancy by local immunotherapy. Sci Transl Med. 2018 Jan 31. Park et al. describe the long-term effects of 19-28z CAR T cell therapy in adults with relapsed B-cell ALL in this phase 1 clinical trial. In patients with a low initial disease burden, CAR T therapy correlated with an increase in both median event-free and overall survival, as well as lower rates of cytokine release syndrome, compared to patients with a high disease burden, who saw only moderate anticancer effects. Peak CAR T cell expansion also correlated with complete remission with minimal residual disease. Maude et al. performed a phase 2, single-cohort study that tested tisagenlecleucel (CD19/4-1BB CAR T cell therapy) in 75 high-risk pediatric and young adult patients with relapsed or refractory B-ALL across 25 treatment centers on 4 continents. Three months after a single infusion of CAR T cells, the overall and complete remission rates were 81% and 60% respectively. Most patients who responded to therapy, however, experienced transient, high-grade toxicity. CAR T cells persisted long term and remission was durable. Menk et al. discovered that TCR signaling activates pyruvate dehydrogenase kinase 1 (PDHK1), which leads to an immediate metabolic switch to aerobic glycolysis by inhibiting intake of pyruvate into the mitochondria, resulting in lactate secretion via lactate dehydrogenase (LDH). Early cytokine (IFNγ, TNFα, IL-2) production is controlled by the PDHK1-mediated metabolic switch via release of LDH from its repressive translational role on RNA, but PDHK1 does not regulate other effector functions such as cytotoxicity or proliferation. In an effort to improve T cell trafficking to the tumor, Moon et al. aimed to increase levels of CXCL11 (a chemokine that attracts effector T cells via the CXCR3 receptor) in the murine tumor microenvironment. After failing to demonstrate improved tumor control by delivering CXCL11 as part of a mesothelin-targeted CAR vector, the team used a modified oncolytic vaccinia virus as a CXCL11 vector (VV.CXCL11) which improved T cell infiltration, tumor control, and overall survival only when combined with an E7 cancer vaccine or with antigen-specific CAR T cells. Based on encouraging in vitro results, Fotaki et al. aimed to develop an off-the-shelf dendritic cell (DC) vaccine by delivering allogeneic, pro-inflammatory DCs expressing gp100 to melanoma-bearing mice. In response, host bystander DCs migrated to draining lymph nodes and showed markers of activation, NK cells and neutrophils were recruited to the injection site, and gp100-specific CD8+ T cells were generated. Additional adoptive transfer of gp100-specific T cells yielded a slight survival benefit. In MLH1-/- mice representative of mismatch repair deficiency (MMR-D)-associated syndromes, Maletzki et al. tested the prophylactic and therapeutic use of an allograft tumor cellular lysate vaccine. Prophylactic vaccination increased tumor-reactive circulating T cells and delayed tumor growth, while therapeutic vaccination reduced tumor burden and prolonged overall survival. Vaccination increased CD4+ and CD8+ T cell infiltration, cytotoxic T cells, and NK cells in tumors, which demonstrated upregulation of PD-L1 and increased mutation burden. Zhu et al. identified a Ly6GmiLy6CloCD11b+CXCR2+ subset of MDSCs expanded in murine breast cancer tumors and in peripheral blood, and found that this cell subset promotes breast cancer metastasis to the lungs and lymph nodes in 4T1 mice by enhancing an epithelial-mesenchymal transition of tumor cells, potentially via IL-6, and by upregulating immunosuppressive checkpoint markers on CD4+ and CD8+ T cells in an IFNγ-dependent manner. In an attempt to capitalize on the strong inflammatory state induced by alloreactivity, Fotaki et al. infected monocyte-derived dendritic cells (DCs) with an infection-enhanced adenoviral vector (which could be used to encode a target antigen) and matured them with polyI:C, R848, and IFNγ. These DCs released pro-inflammatory cytokines and, when co-cultured with PBMCs, promoted the maturation of bystander DCs capable of cross-presenting a target antigen to CD8+ T cells, effectively activated T and NK cells, and promoted cytotoxic function.